Artesa is a celebration of the harmony between nature, art & architecture. The Codorníu Raventós family is historically passionate about art, craft, and natural preservation, so when they set out to create their first winery outside of Spain, they sought to preserve the magical landscape that lured them here, and create a work of art that would do justice to the place and the caliber of wines they knew it would someday produce. Designed by renowned Barcelona architect, Domingo Triay, the avant-garde winery was built in 1991 to blend seamlessly with the surrounding landscape. Set into a high hill at the south of the estate with a protective covering of native grasses, the winery is kept naturally cool by its earthen construction and offers panoramic vistas. Entering Artesa’s Tasting Salon reflects both the winery’s native and adopted homes, drawing inspiration from the art, culture and nature of both Barcelona and the Bay Area. 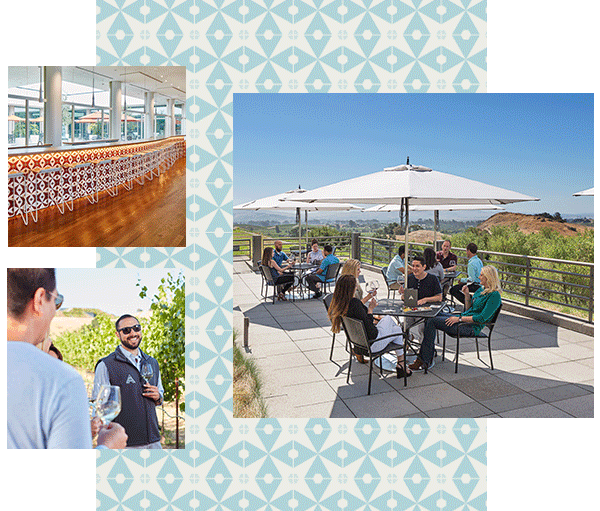 Featuring sweeping views with floor to ceiling windows, the tasting room and courtyard is the idyllic place to indulge in wine and culture. At the heart of the chic, bright-white space is a dramatic circular bar covered with hand-made tiles, custom designed and imported from Barcelona. Leather lounge chairs and tall white ‘tapas’ tables complete the atmosphere of relaxed luxury, reminiscent of the Mediterranean waterfront. Designed by Signum Architecture, the Artesa Tasting Salon was awarded the 2018 Design Award from the American Institute of Architects. Artesa’s bottles are decorated with works of art commissioned to express the distinct personality and story of each wine, and pay tribute to classic Spanish hand crafts, including tiles, textiles, woodwork, filigree and of course, painting.